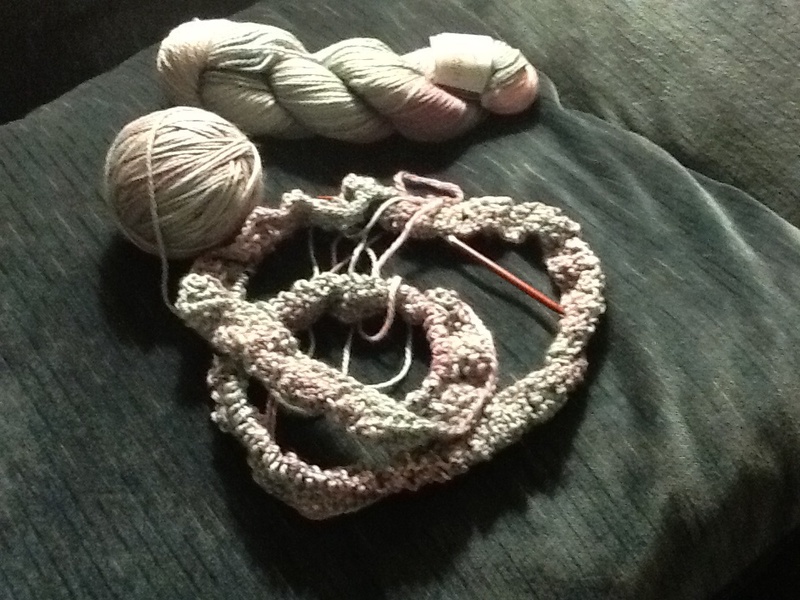 Yes, I just shared new yarn last week. My Dark Side of the Moon scarf is now about 8 inches long and continues to make me happy, which is the ultimate goal of any hobby! Jimmy Beans Wool is a fabulous yarn store in Reno, NV. I have to shop online, but their customer service is great – sometimes they warp the space-time continuum and I get my order in two days. Unbelievable! They have a very talented staff who design and run a variety on knit-alongs, many based on popular TV shows. The above yarn was inspired by Elsa from Frozen, who has taken over the ABC show “Once Upon A Time.” It is actually shades of icy blue and light teal, merging into pink and lavender. I did not actually join the knit-along, shocking I know since I tend to join everything! But my daughter has a solo part in this year’s Christmas ice skating recital, and they are doing Frozen. So, I had the crazy/brilliant idea to make the director a cowl. The yarn is Lorna’s Laces Shepherd Worsted, and it is so soft and cuddly! I picked an easy-to-memorize pattern called “Bar Hopping Cowl,” and I will take better pictures once you can begin to see the pattern. I have three rows done plus the seed stitch border. And I have to mention the needles. You can barely see the red tips in the photo. I made a cost-saving decision to try Knitter’s Pride Dreamz instead of my usual Addi brand. So far, I am impressed. They have very sharp tips which is helpful, although the tip is longer than I am used to. The join on the circular is smooth. Overall, a thumbs up. Tis the season – are you doing any handmade gifts this year?